If you can't beat 'em, join 'em -- and pay 'em handsomely. This credo was recently employed by Swiss bank UBS. The firm, which in the past two years has earned widespread infamy for helping U.S. customers hide billions of cash in tax shelters, has just hired two ex-Washington insiders: Mona Sutphen, President Obama's ex-deputy chief of staff, will become the leader of macro analysis for UBS Wealth Management; and Alexander Friedman, who served in the U.S. Defense Department under President Clinton, will hold the title of UBS Wealth Management chief investment officer (a newly-created position). 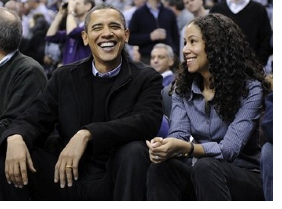 Although Sutphen (pictured above with Barack) does not have any Wall Street experience (the closest thing resembling financial experience on her resume as of late is a stint as a managing director at a business strategy firm), Friedman spent some time at investment banking boutique Lazard working in M&A and, more recently, served as CFO of the Bill and Melinda Gates Foundation. Still, if you're thinking what I'm thinking, then you're assuming that UBS hired these two in order to get in good with the government of the U.S. of A. That is, to have a couple of folks on the payroll who'll know how and exactly where to smooch Uncle Sam under his red-and-white-striped trousers the next time the going gets tough. "The chief investment officer function will focus on wealth protection and optimized financial returns consistent with client objectives. Friedman and his team will be responsible for defining and proposing appropriate investment allocations and strategies and for communicating them across the platform ... The creation of the chief investment officer function illustrates our genuine commitment to financial performance for our clients ... Friedman, Sutphen and Haefele's [Mark Haefele, a hedge fund manager, was also hired] extensive knowledge and complementary skills will be greatly beneficial to our organization and our clients."